Gathotkaca Gandrung from Ronald L. C. Kienhuis on Vimeo. Gathutkaca Gandrung is a popular dance in the Surakarta (the court city in Central Java also known as Solo) style. 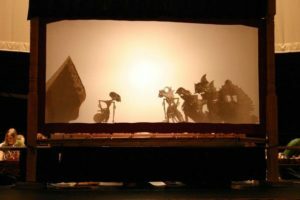 This dance depicts Gathutkaca, a beloved hero from Javanese mythology, dressing himself and dreaming of the object of his affections, Pregiwa, the daughter of Arjuna. Gathutkaca possesses magical powers which enable him to fly, and is a fierce warrior, but never uses a weapon in battle. The dance is in the gagah style, a forceful and powerful male style, used for the roles of strongly built kasatriyas, soldiers and generals. Gamelan Kusuma Laras, directed by I.M. Harjito. An excerpt of Gendhing Kombang Mara, pelog lima from the concert, Music and Dance of Java, performed in New York, December 1, 2007.